In October 1834, the Preston Chronicle described the recently completed Town Hall as ‘The Pride of Birmingham and an Ornament to England’. This impressive neoclassical temple was Britain’s first genuinely civic building. 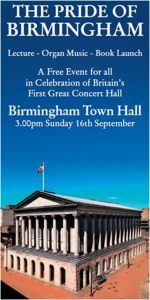 Designed to house the country’s first great public concert hall, Birmingham Town Hall was a ground-breaker. It survives as an historic building of national standing. The book on the Town Hall unveils discoveries aplenty about the building’s origins, its design, uses, evolution and recent transformation. Please go to the Lund Humphries website to purchase the book on-line. Birmingham Town Hall occupies a central place in the history of Britain’s second city. Built in 1834 to champion and reflect Birmingham’s civic achievements, the Town Hall’s design was based on the form and style of a partially surviving Roman temple and involved architectural luminaries such as Sir John Soane. This is the first book to provide an accessible account of the building’s construction and history. In addition to the book’s commentary on the Town Hall’s origins and design, consideration is also given to the several schemes of alteration undertaken over the course of the building’s history, including that completed in 2007. The narrative is built upon evidence gathered by the author over the course of a decade from archival sources and through extensive site-based fabric recording and analysis. The texts are handsomely illustrated with photographs and reproductions of archival drawings, engravings etc. This hardback book measures 26 x 23 cms., is 250 pages long and features 290 images, 173 of which are printed in colour.